Death Note has to be my favourite anime period, don’t know about you but I don’t like constant action and fighting that becomes repetitive not saying that this is a bad thing but when there is nothing else to a show it become tedious whereas Death Note is the total opposite of this. I love that it’s not a two dimensional with a predictable plot it makes your question morals, what is right and wrong what side are you on? The characters develop as the series progresses and you never know what is around the corner. For this post I’m bringing you Light Yagami’s cosplay tutorial. 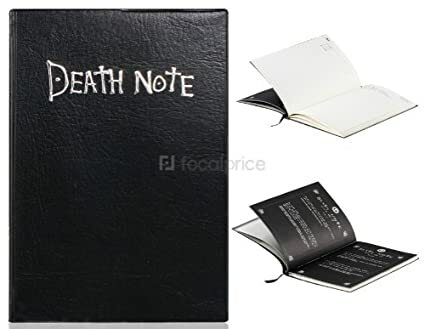 Light is the main protagonist, at the beginning of the show he finds a journal that kills whoever’s name is written in it. He decides to rid the world of criminals and those that disagree with his ideology that’s until L comes into the picture and attempts to bring him down. 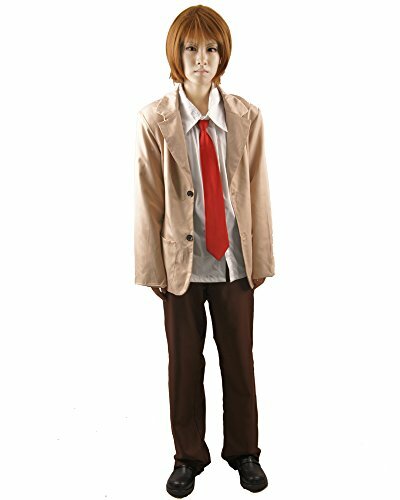 As with a lot of anime the main character is a teenager and so his main outfit is his school uniform, the first item is the tan blazer then underneath that a white school shirt and a red tie and finally a tan pants to match the blazer. Here is the complete outfit, I did compare prices and convenience between getting everything separate vs complete, you can still get everything separate if you want but it’s pricey and for the ease it’s better to get the whole thing at once. However give it a few weeks to ship, it includes everything bar the wig and that isn’t even needed if you follow the suit of the reference image and use your natural hair. Totally up to you. Like I said already he is a typical teenager so although he is seen in the tan uniform ninety percent of the time he does wear other outfits, I won’t include them here because they aren’t as recognizable as his main ensemble and are general causal everyday things. The next part is hair, Light’s hair is pretty typical for anime characters is quite spiky, brown and short. The image above isn’t the best example of this, either use gel on your natural hair or get yourself a wig. 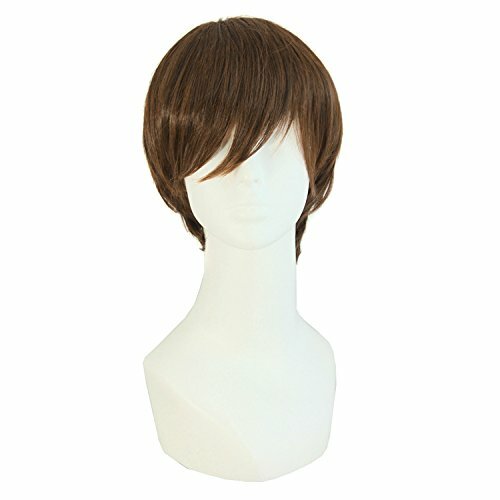 Here is a wig (pictured) that you can use that is a little lighter than others, you may have noticed in some pictures Light’s hair has a sandy look to it. From the reference image above you can see the final accessory is a juicy red apple, shinigami (death gods) love apples so keep some on hands to keep them on side. Along with the apple you’ll need to carry the Death Note around with you and make sure no-one else get their hands on it especially ‘L’, write a few names in it in Japanese for effect. At a certain point L and Light are handcuffed together so that Light can prove his innocence (even though he isn’t) so you can bring a friend along as L too and be handcuffed together. Any handcuffs will work but there are replicas on sites like Etsy. Finally go about incorporating some of this character’s personality into your cosplay, be very on your toes deductive and deceptive. Never let anyone get the better of you and always plan ten steps ahead. This is a popular theme for couples too, here is the Misa tutorial I did for you with three different outfits she wears. Misa technically isn’t Light’s girlfriend but she doesn’t quite get the hint never the less he does have a soft side for her even if he is quite evil with everyone else.